This beautiful bracket-style mantel clock is handcrafted from solid Black Walnut, and features a Traditional Walnut, hand-rubbed finish. The glass-front door has solid brass hinges and knob. The brass dial has a satin finish and features a delicately etched scroll design. 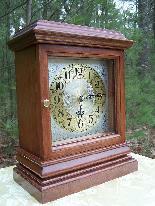 This quartz clock makes a wonderful anniversary or wedding gift, and would be the perfect addition to any mantel, desk or tabletop. Each Quality Heirloom piece is handcrafted, one at a time, and features exceptional quality craftsmanship. This beautiful mantel clock will surely become a cherished family heirloom that will be proudly passed on to future generations. 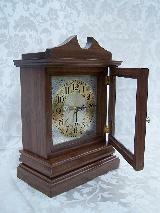 This beautiful bracket-style mantel clock is handcrafted from solid Cherry, and features a Traditional Cherry, hand-rubbed finish. The glass-front door has solid brass hinges and knob. The brass dial has a satin finish and features a delicately etched scroll design. 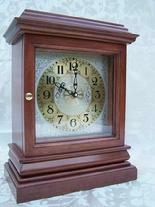 This quartz clock makes a wonderful anniversary or wedding gift, and includes six selectable chimes that play every hour, including the famous Westminster Chimes and Ave Maria. click below to complete our on-line form.